Everyday, an average of 150,000 people die worldwide. What kills them varies wildly from country to country. 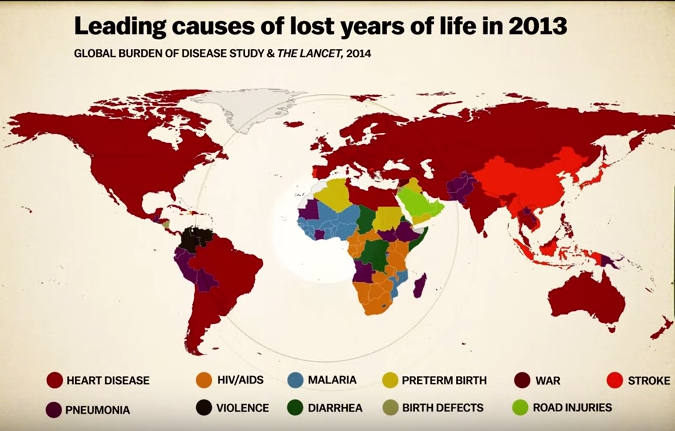 Citing the collaborative research of hundreds of researchers from around the world, the following short video from Vox.com shows the number one cause of early death by country. The results clearly demonstrate the influence of geography, culture, and economics on human mortality. Here is a map of the data pulled from the video. The video also introduces the idea of measuring “years of life lost”, which compares the age of death to the potential maximum lifespan (presently an average of around 86 years). This method captures the true scope and tragedy of early death. After all, a country can have a high death rate because its aging population is reaching the limit of human longevity; hence why the leading causes of death in richer country are those that tend to strike the old, like stroke and heart disease. This shows that most people in those nations are managing to live long lives at or near (if not beyond) the potential human average. But if most people in a given country are dying from things that occur well before old age, than it denotes serious socioeconomic and political problems: issues like war, lack of public health infrastructure, rampant poverty, and so on. Hence why poorer countries have more people dying from causes that are otherwise easily cured, treated, or even preempted in richer nations. As the video points out, as many as 40 percent of the deaths in Sub-Saharan Africa occur to people less than five years old. This is a stunning figure, especially when one looks at the specifics: something as mundane in the developed world as diarrhea can be a death sentence in other parts of the world. And for all our concerns about violent crime, most people in the U.S., Europe, and other developed nations can rest assured that they are unlikely to die at the hands of another person (though for certain communities within these countries, that is a different story). A country’s leading cause of death can also reveal certain peculiarities in their culture, history, or society. Persian Gulf countries have a strong subculture geared around drag racing and risky driving, leading to their unusually high rate of death by car accidents. This could be linked to high youth unemployment and a repressive social environment, which leads to boredom, angst, and the pursuit of these sorts of thrills. Meanwhile, China’s high rate of stroke deaths portends its rapid development and industrialization, but also spells trouble as it deals with rich-world problems without yet establishing a rich-world public health system. This data is at once fascinating and disconcerting. It shows the huge level of disparity between certain parts of the world, and reaffirms how our success in life — including our capacity to live full, healthy lives — is largely a product of random chance. We are at the mercy of geography. Had I been born in Bolivia, the Congo, or Pakistan, I could have long died from the banal childhood afflictions I suffered without worry. Then again, if had I been born in North America, Europe, or Australia a century or two earlier, there would be a similar likelihood of dying from infectious disease. According to CityLab, London almost had a “Death Pyramid” — a towering mausoleum that would have interred around 5 million residents. In the 1820s, the architect [Thomas Wilson] proposed to build a colossal pyramid called the Metropolitan Sepulchre. Sited for Primrose Hill, today a park area in North London, the necropolis was designed to alleviate the overpopulation of London’s graveyards while adding a looming monument to mortality to the city’s skyline. With the Metropolitan Sepulchre, Wilson envisioned a honeycomb of catacombs, each one capable of holding up to 24 coffins. The whole structure would have occupied a plot 18 acres in area; at more than 90 stories tall, it would have easily eclipsed St. Paul’s Cathedral. While it may have been inspired by the Great Pyramid at Giza, this necropolis was meant to be a true city of the dead, not just a palace for a pharaoh. The British pyramid would have served as the final resting grounds for some 5 million Londoners had the city gone with Wilson. As the article notes, such “vertical cemeteries” are catching on throughout the world’s fast-growing cities, from Mexico City and Paris to Mumbai and Tel Aviv. As humanity continues to urbanize like never before, perhaps we can expect more audacious necropolises bestriding our modern skyscrapers. The Merry Cemetery, located in the Romanian village of Săpânța, stands out for its colorful and sometimes whimsical tombstones, which depict scenes from the departed’s life alongside poems. The paintings display everything from the individual’s profession, to major events or just routine images of everyday life; a few show how they died. The origins of this practice, which diverges from the prevailing European notion that death is as somber occasion, are said to stem from Stan Ioan Pătraş (1908-1977), a local artist and woodsculpter who is responsible for constructing the 700 or so epitaphs. On a deeper level, some have speculated that the Orthodox Christian cemetery draws inspiration from the Zalmoxis religion of the Dacians, who lived in the area prior to the arrival of the Roman. They believed in the immortality of the soul and the subsequent idea that death was a moment that should be filled with joy and anticipation for a better life. Whatever its origins and one’s views on death, the Merry Cemetery is definitely an interesting location, with an ambiance that is far more jovial than most graveyards. My thoughts and reflections related to Veterans Day, and on war in general, have not changed much since the last time I shared them. This year’s post will not be any less somber, however: as the one hundredth anniversary of the end of history’s first (but sadly not last) “Great War”, the commemorations are especially solemn and reflective. 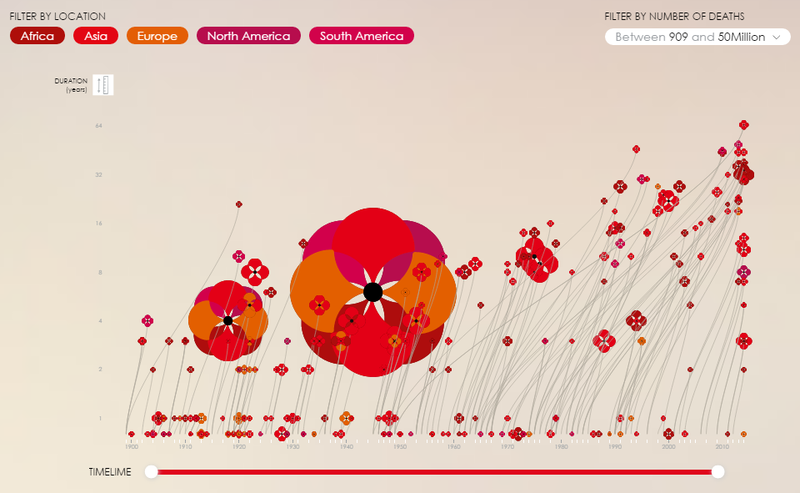 To mark this grim centenary of the First World War, an independent project called Poppy Field was launched to visualize just how devastating this conflict was — a reminder we sadly never need enough of, given how many other horrific conflicts have transpired since the “war to end all wars”. Using the opportunity to highlight the brutality and tragedy of war as a whole, the project moves beyond WWI to show every conflict that has every occurred in the 20th century onward, from the lesser-known civil conflicts of Colombia and the Philippines, to the present strife in Syria, Ukraine, and the Central African Republic (notice how most of these wars tend to occur within states rather than between them). 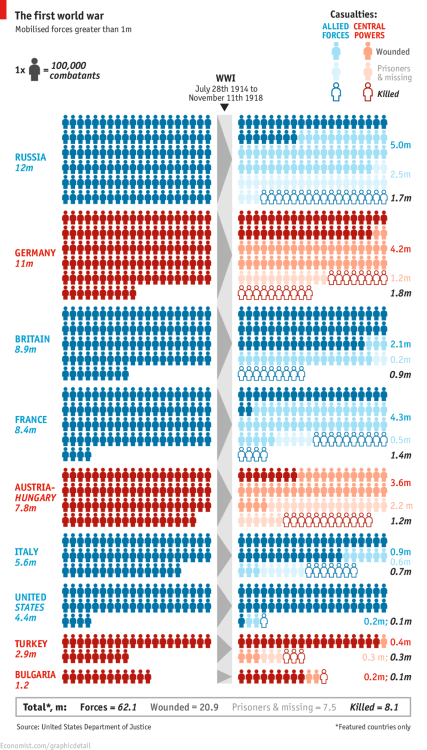 The infographic is as beautiful as it is informative, creatively displaying the length, fatality, and location of each recorded war through the use of stylized poppies (the flower became a symbol of commemoration because it was among the first plants to emerge from Europe’s devastated battlefields after WWI, with its blood-red color and resilient yet delicate nature evoking war). There are several patterns to note here. As mentioned before, most wars have become “internal” in nature — usually fought between governments and rebels, among different ethnic or religious groups, or between breakaway regions and a central power; tellingly, these types of conflicts are especially common in post-colonial Africa and Asia, a legacy of ancient grievances combined with the arbitrary borders that ignored such histories and diversities imposed by European powers. It also seems that wars have become more frequent since the mid-20th century, although comparatively less deadly than the two great wars that dominated the earlier half (and that for most people serve as a common point of comparison, despite their anomalous nature in terms of scale). Modern wars also appear to last much longer, often drawing out into what are known as “low intensity” or “fourth-generation ” conflicts, in which the lines are blurred between civilians and combatants, and fighting is conducted in such a scope as to become normalized. In any case, war’s every changing nature in terms of tactics and characteristics does little to change the awful human cost. Looking at these beautiful poppies and the data attached to each of them, it is easy to forget that they represents millions of full, individual lives snuffed out just this past 114 years alone. Especially from this physical and psychological distance. 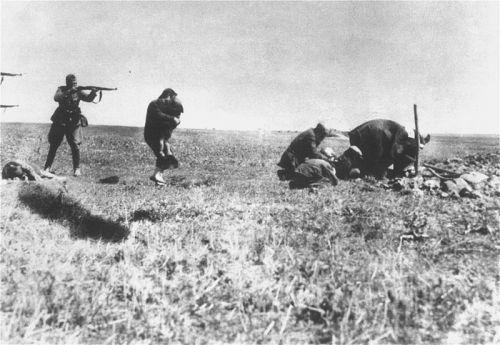 Execution of Jews near Ivanhorod by German Einsatzgruppe during World War II. A woman is attempting to protect a child with her own body just before they are fired on with rifles at close range. This now iconic photograph was mailed from the Eastern Front to Germany and intercepted by a member of the Home Army Polish resistance. British journalist Robert Fisk declared it “one of the most impressive and persuasive images of the Nazi Holocaust.” It was featured in numerous books, and at photo-exhibits both in Poland and Germany, as “precious and terrible evidence” of “the Nazi cruelties in Eastern Europe.” It’s disturbing to think that this horrific tragedy was but a small fraction of the atrocities that were going on throughout the duration of the war. I wonder what is going through the minds of not only the victims, but their murderers; what kind of a person could take human life this easily? What state of mind would you have to be to do something so heinous, especially if you have no prior history of such cruelty (as many such men didn’t)? How does one not pause at the sight of a mother shielding her child? If the perpetrators survived the war, how did they go through the rest of their lives? Did they rationalize these actions, eventually regret them, or tried to forget? It’s difficult to come to grips with how normal people are capable of such remarkable evil given the right circumstances. Most genocides and other mass-scale injustices require the participation or tacit approval of many people, far more than could be deemed insane or criminal. It’s disturbing how relatively easy it is for certain societies to acquiesce or take part in barbarity they couldn’t previously concede to. It’s definitely something to keep in mind. “Death and Life”, by Gustav Klimt. Begun in 1908 and completed in 1916. This painting is unique in that it portrays death with a sense of hope and acceptance — instead of feeling threatened by the figure of death, the humans seem unconcerned. Even the personification of death doesn’t seem particularly menacing, comparatively speaking. Klimt was near the end of his life at the time — he would pass away two years later — and the painting has been interpreted as reflecting his acceptance of mortality. Indeed, he chose to depict moments of pleasure, beauty, youth, and serenity among his subjects. Although long overshadowed by the far more destructive Second World War, it was World War I (then known as the Great War) that first gave humanity a bloody taste of large-scale, industrialized warfare. Indeed, the unresolved conflicts of the First World War is what largely gave rise to the second. All that aside, the amount of death wrought by this aptly proclaimed “War to End All Wars” is staggering, as the following chart from The Economist soberingly displays. I’ll let the numbers speak for themselves. An entire generation was ground up in a senseless war that everyone thought would be over in no time. Every single one of those men was a distinct human being with his own identity, personality, dreams, fears, and loved ones. It’s hard to believe tens of millions more would join them just two decades or so later — and many more have since, albeit in far less visible conflicts. Social media has allowed average people to establish a persistent and indefinite presence on the internet, namely through profiles like Facebook. It’s strange to imagine that after we pass away, all these photos, posts, and other means of expression will otherwise remain permanently recorded. It can also be eerie when someone has died unexpectedly, leaving you with a timeline of last words and activities. I’ve also seen the profiles of deceased people become shrines of sorts, with many loved ones browsing through them to capture the essence of their departed. I’m not sure of what to make of that — on the one hand, it’s nice to be able to retain so much of a person long after they die; but on the other hand, it may make it more difficult to let go. I can imagine that very soon, it may become common for someone to mention in their will what should be done with their various social media profiles. What are your thoughts and experiences with this?